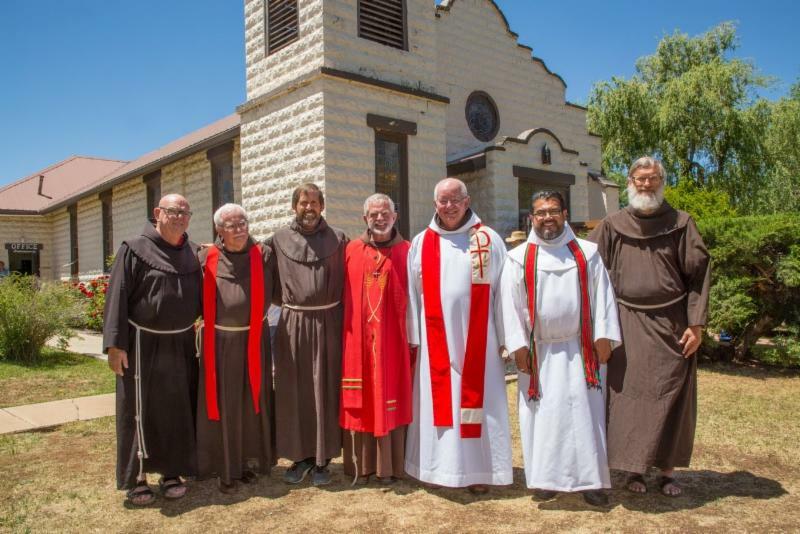 ALBUQUERQUE, N.M. — Voicing their support for the revitalization of Franciscan life in the United States, six provinces of the Order of Friars Minor have voted to form one new organization. On May 30, the friars of each of the six provinces voted at meetings in their communities to support the formation of one new organization. It will comprise the almost 1,000 Catholic Franciscan friars belonging to the existing provinces – both brothers and priests – and will be headquartered in a yet-to-be determined location. The reconfiguration will not happen immediately. The next step in the process is to obtain approval to unify from the Order’s minister general, Fr. 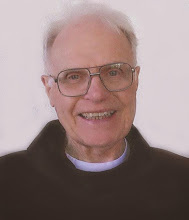 Michael Perry, OFM, who is based in Rome. 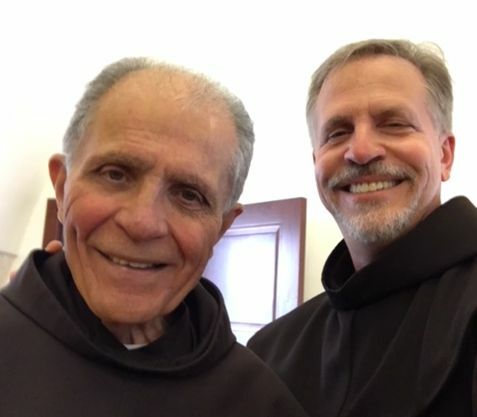 Should he decide that such a reconfiguration would be helpful to Franciscan life and ministry, he will appoint a delegate to visit all the friars in the United States. If his delegate’s report is favorable, it is expected that the process of reconfiguration will move forward. Meanwhile, the process is continuing as issues of canon and civil law are resolved. In an historic decision, solemnly professed friars from all six US provinces involved in the R + R (Restructuring + Revitalization) process decided in a consultative vote to form a single new entity. This important threshold moment is part of a continuing process, expected to take several years, which is subject to final approval by the Minister General and General Curia. against. 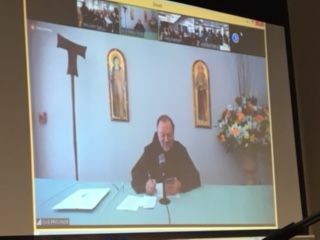 The nationwide tally was announced by Provincial Minister Jack Clark Robinson of Our Lady of Guadalupe Province on behalf of the participating provinces in a “live” Internet broadcast viewed simultaneously by friars throughout the United States. The measure passed in all six provinces, with following percentage in favor of the resolution: St. John the Baptist (90%); Assumption of the Blessed Virgin Mary (88%); Our Lady of Guadalupe (80%); Holy Names (70%); Sacred Heart (59%); and St. Barbara Province (58%). 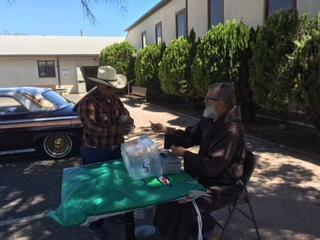 The immediate response among the friars assembled at Old Mission San Luis Rey was understandably subdued in view of the fact that a substantial minority of our confreres had voted against the proposal. 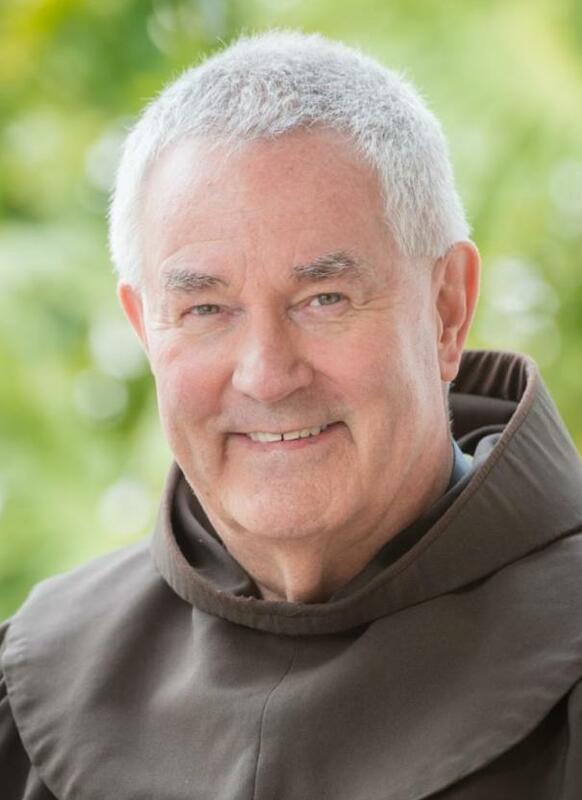 Provincial Minister David Gaa expressed his gratitude and appreciation to all of the friars present for their prayer-filled and thoughtful consideration of an issue which, for us, has been six years in its evolution and development. He also “named” the response both he and a great number of friars present were experiencing: “Most of us have gone through a whole roller coaster of feelings and emotions this week. It takes time to reflect upon and talk over things with people we trust and love. 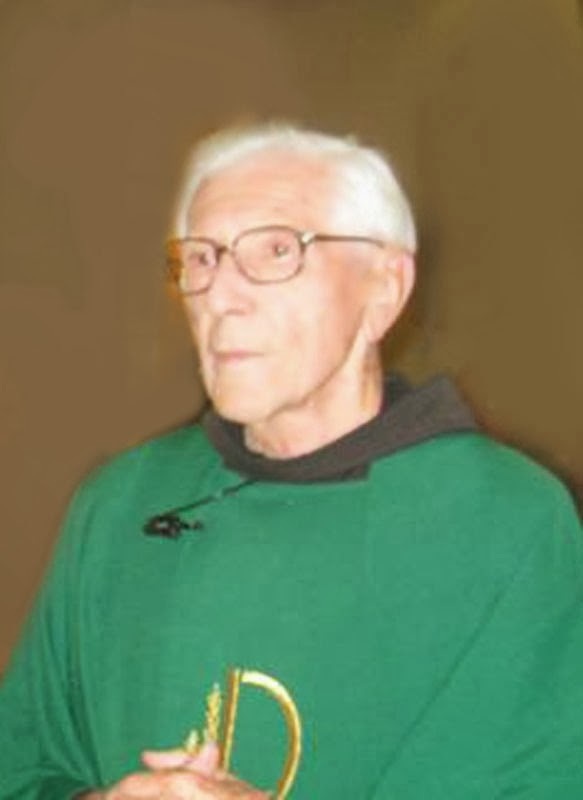 It is all too soon and too raw yet to comment on.” He reinforced his views in the closing Mass at the Old Mission Church, following an hour-long meeting in which friars remembered our confreres who have died in the past year. 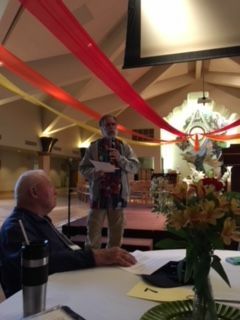 By the time of the vote, the friars of St. Barbara province had already been meeting in an Extraordinary Chapter at Serra Center, Old Mission San Luis Rey (May 29 and 30) for two full days of prayer, presentations, and open mike sharing as a final preparation for the crucial vote. Friar Mark Schroeder chaired the session, organized by a special Chapter Steering Committee, which did a superb job in coordinating every aspect of the event. 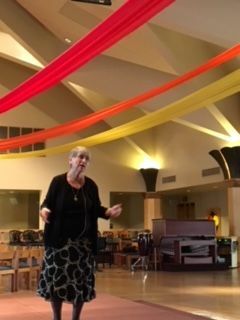 Keynote speaker was Franciscan Sister Margaret Carney, former President of St. Bonaventure University, New York. Acknowledging both the gravity and the difficulty of this particular decision-making effort, Sister Margaret vowed “not to slip into advocacy” but to do her best to help the friars determine “how to best preserve the unity of fraternitas, regardless of the outcome (of the vote).” Her presentation addressed three major areas of concern in this respect: what we mean by the vote we are taking; the “voices” from a secular perspective which might help us to discern more clearly; and, finally, the resources we can apply from our own Franciscan heritage in our decision making “as we lean into the future.” In her concluding remarks, Sister Margaret urged friars to examine their consciences carefully—“By what spirits am I being led in my choices?”—in order to arrive at a personal decision marked by clarity and inner peace. Friar Mark Schroeder moderates Extraordinary Chapter session. Provincial Minister Jack Clark Robinson (OLG) announces vote tally. 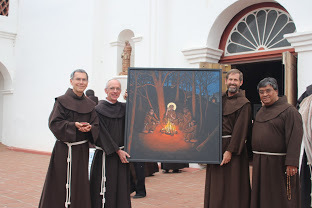 The Extraordinary Chapter concluded on May 30, with a closing Mass and a special blessing and “sending forth” of an icon originally commissioned by Ohio artist Kelly Lattimore for the Interprovincial Novitiate. 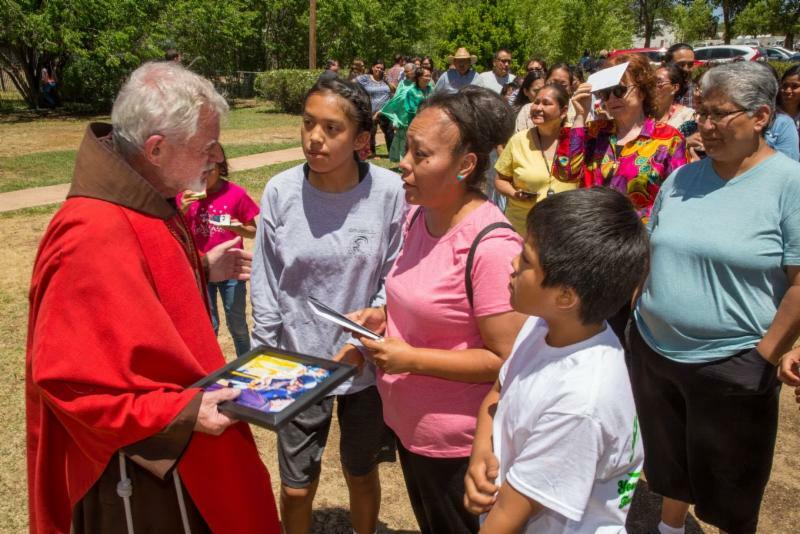 The image, along with relics of both St. Francis and St. Clare, will “visit” each of the houses in the Province in the coming months in anticipation of the Fall Convocations. 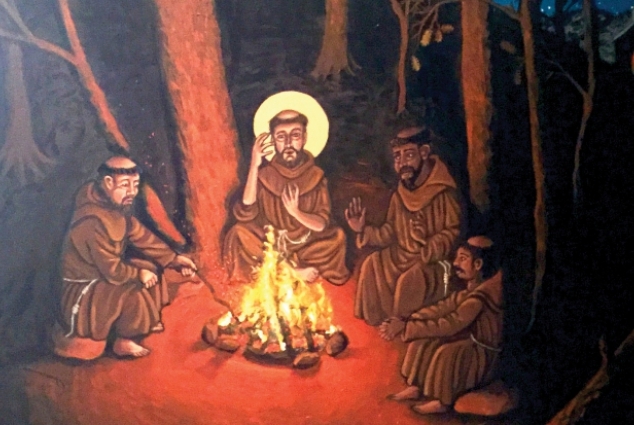 Entitled “ St. Francis and the Novices,” the artwork takes its inspiration from 2 Timothy-- “Stir into flame the gifts God has given us” – and will serve as the theme for the upcoming provincial Chapter 2019. The full pilgrimage itinerary will be published in the next issue of OFM. FYI. The Gospel we have just heard is from the day of Father Dolan’s death. I am chagrined, embarrassed although humored as well by how many people think that now in retirement I do nothing but play golf. I would be happy if that were the case, but I have discovered that every day is very full doing what I was ordained to do. Many of us in retirement are asked by people who know us to provide weddings and funerals. Apparently, Larry listed me as the homilist for his funeral in that same spirit. We were very young together. We were ordained together. We recovered becoming fellow friends of Bill W together. And so many times, including until just before Larry was deeply sedated never to wake up, we laughed together-- a lot. This is an honor, of course, but very intimidating. One of the friars who informed me of Larry’s wishes, trying to ease my anxiety, urged me to tell stories about our experiences as seminarians. But I have a hunch that Larry has already regaled the friars with many such stories – even perhaps with a touch of hyperbole. We priests are encouraged in preaching at funerals to avoid giving a eulogy, speaking about the deceased, and urged to focus on the risen Lord Jesus Christ. That should be easy, especially since Larry suffered his last illness and died in Easter time. It was my privilege as a brother priest to pray the Mass for Larry at that powerful moment. I was very uplifted by the Gospel words of Jesus for the day Father Laurence Patrick Dolan died. Just two years ago, Larry and I hosted here at the Mission San Luis Rey a gathering of our ordination classmates. In the late summer of 1962, 77 of us from around the country set sail from New York aboard the Leonardo di Vinci for Italy and the North American College. On board were most of the bishops of the US and Latin America on their way to Rome for the Second Vatican Council. Those were thrilling times. A few years later, just ten days after the solemn closing of the Council, 55 of the original 77 of us were ordained priests at the altar of the chair in St. Peter’s Basilica. That was 1965. In Just five years, over half had left the ministry to marry. Those were the 1960’s. By the time we gathered here for our 50th anniversary of ordination, 15 had died. But the reunion was a great success. With the help of a facilitator we talked about our lives and experiences with many of the wives joining in. Writing by email to inform the class of Larry’s death, I received many messages of condolences. Virtually everyone commented, not surprisingly, on Larry Dolan’s healing gift of laughter. Like the Lord Jesus, Larry liked to think of God in an intimate way. Our Lord used a name for God that was unique. Devout Jews, out of reverence, avoid the name “God” and use descriptive words like El Shaddai, Adonai, Elohim: The Almighty, the Lord, the Eternal One. Jesus liked to refer to God the Father as “the One who sent me.” That phrase captured both who God is for him and how Jesus saw himself. Jesus saw Himself as one sent by God with a mission to complete. 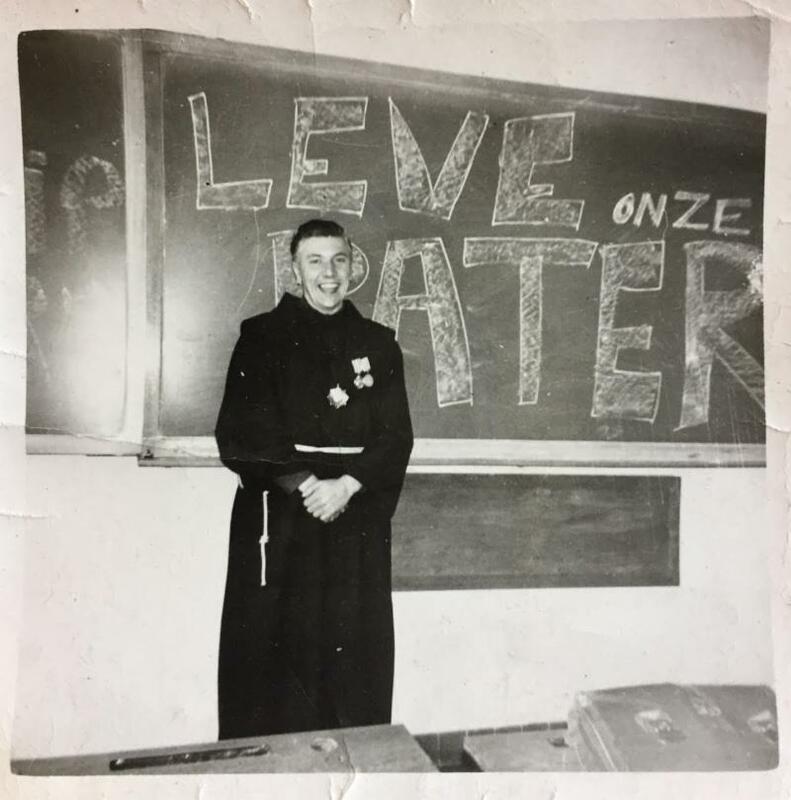 Laurence Patrick Dolan was a man and a priest with a mission in life. How fitting it is that we gather for his funeral in this ancient and beautiful Mission church. His mission is now complete. We accompany him with our prayers, love and gratitude. I believe that Christian's desire for all of us was to be a people of the Resurrection, ready to rise up out of our fears, paralysis, and indifference into fuller and richer engagement with the world-- and in the process, build new bonds of communion across any border that might threaten to divide. The most hopeful song Christian ever taught me (and he taught me a few) was one called Proschai (which he first heard performed by his beloved Limelighters.). It is a song of hope and of farewell. It includes the lines: "Around this world, we've lots of friends we know you'd like to know, we'll sing together from Maine to Mexico" --- We'll be singing on, dear Brother, until we all meet again! Proschai! I heard about Christian from a few folks, the first one being a Vietnamese friend who works for OCP (Oregon Catholic Press) in Saigon and met Christian when this Vietnamese friend was able to attend the religious Ed Congress in LA. Christian's death has given me lots to think about. Not only was he a frequent visitor to my parents, on his regular trips up to Salem, Oregon but he played a very important role in supporting Mom during the 13 months that Dad was dying with his brain tumor. Always arrived with his banjo and his laugh in tow. I have so many memories of Christian, almost all of them good and/or funny! What a role he played in our formation. I still remember how, in our LA novitiate, he spent weeks and lots of money (I was the syndic, so I know...) trying to fix one of his beloved cars, which was later stolen while we were in Guaymas. The thing that irritated him most was not that it was stolen but that, when the police finally found it in Hollywood and returned it, he learned that the thief had fixed the problem that he had fruitlessly tried to find! 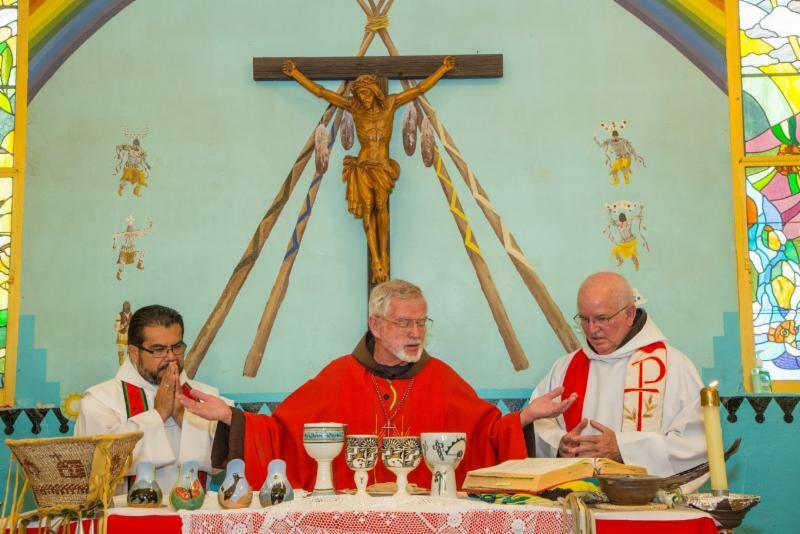 At the Pentecost Mass celebrated at St. Francis Mission in Whiteriver, Arizona, Friar Eddie Fronske bade farewell to the faith community he has pastored for 35 years. The event also marks the departure of the friars after some 99 years on the reservation. A number of friars, including Provincial Minister David Gaa and Vicar Provincial Martín Ibarra were on hand for the event. Eddie, now actively retired from provincial assignment, will resident at San Xavier Mission Friary, Tucson, effective date June 1. All photos by Tom Bean. PM David Gaa, VP Martín Ibarra, and David Buer. Friar Eddie Fronske (center) surrounded by members of the Whiteriver Apache community. 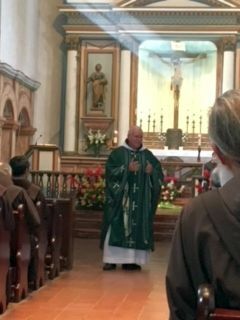 Friar Eddie Fronske at Farewell Mass, May 20, 2018. On Saturday, April 28, 2018, our small community of St. Francis of Assisi Mission Church in Elfrida, AZ held their parish fiesta. It was truly a family affair. One parishioner’s family came from Peoria, AZ, about 3 hours away with a rock-climbing equipment and jumping castle for kids. Another parishioner’s family came with their refurbished antique car for a mini car show. We closed the fiesta with a night of dancing, with live music provided by a family band playing mostly Mexican norteño music. 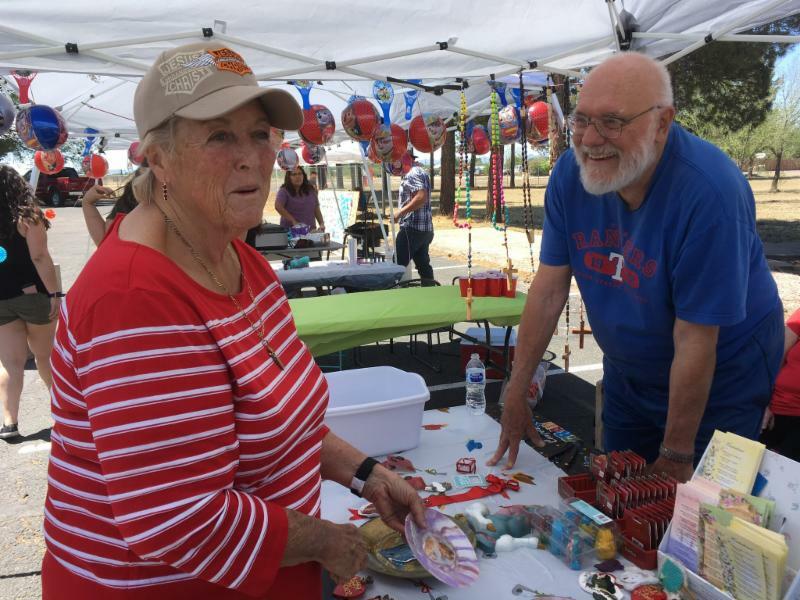 The chairperson of the committee is a 79 year-old parishioner who with the help of her family, shopped and cooked the night before and stayed at the fiesta from set up at 8 am until clean-up at 1 am! Friar David Buer was in charge of selling coupons that can be used to buy food and to pay for games. Joanne Mendoza and Friar Luis Runde (SH) at their art booth. Luis made some big size rosaries by hand (hanging in the background) for sale and auction at the fiesta. 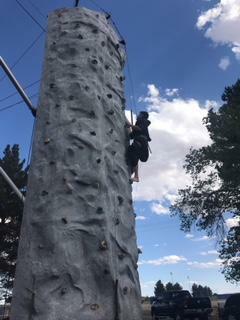 Friar Sam Nasada giving it a try on the rock-climbing wall. 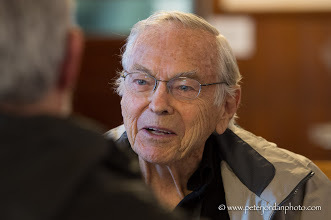 Friars from the Phoenix area gathered at the Atria senior living facility on May 15 to celebrate our brother, Peter Verheggen’s 75th anniversary in the Order. 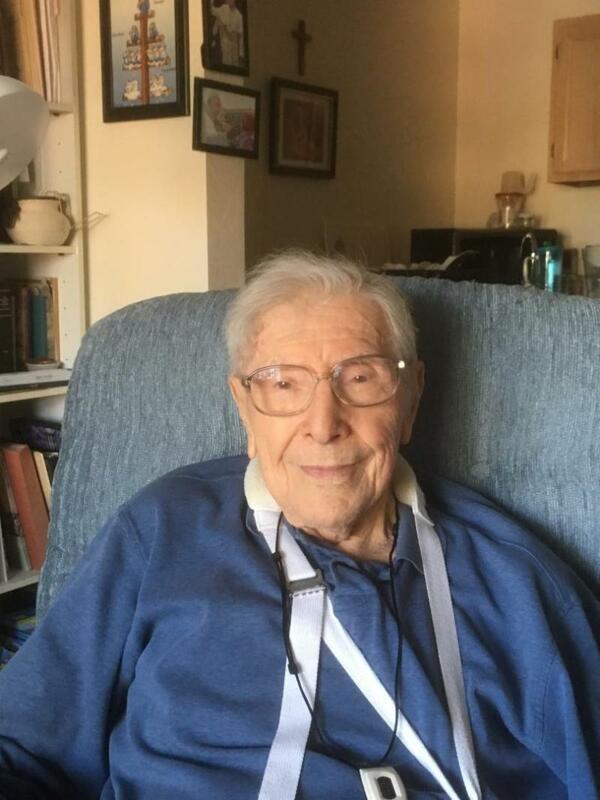 Peter, who will turn 95 in November, continues to be quite actively engaged in friar and local community events. 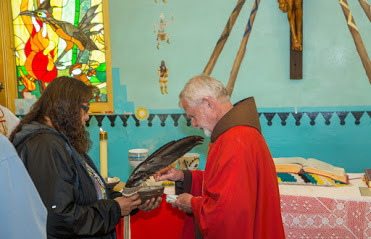 Thank you, Peter, for your tremendous commitment to the friars and to the Native peoples, and for your presence among us! Ad multos annos! Friar Daniel Barica reports that , while on a recent pilgrimage to the Holy Land, he met up in Jerusalem with our brother, Friar Leo Gonzalez (shown here) who is stationed there with the Custody of the Holy Land. Daniel, along with Friar Vincent Nguyen, was accompanying a pilgrimage group which included members of Sts. Simon & Jude Parish, Huntington Beach, California. I just wanted to share this picture I took at the end of April after a short visit with brother Leo. Vincent Nguyen and I were leading a group of 50 pilgrims mostly from Sts Simon & Jude Parish in Huntington Beach to the Holy Land and then on to Assisi. We visited the church at Dominus Flevit on the Mount of Olives where Leo had been for many years but they told me he was not feeling well and had been moved to St. Savior friary in the heart of Jerusalem. It was there that I visited with him and as you can see, he is feeling much better and sends his greetings to the brothers. 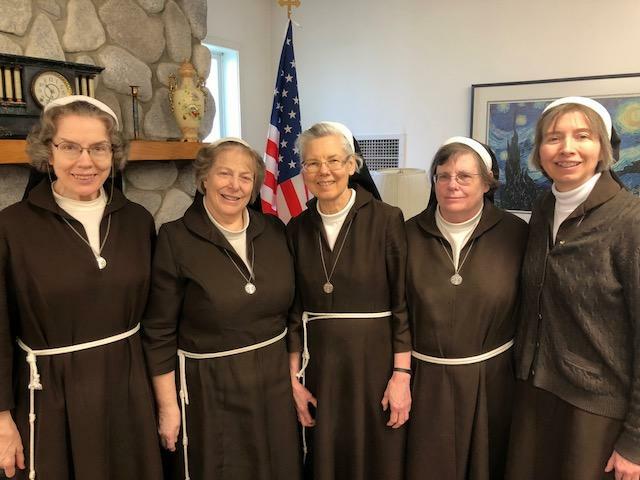 In the presence of Provincial Minister David Gaa, our sisters, the Poor Clare nuns of Spokane, Washington, met earlier this month to hold elections. Congratulations and best wishes to Sister Marcia Kay was elected as Abbess. 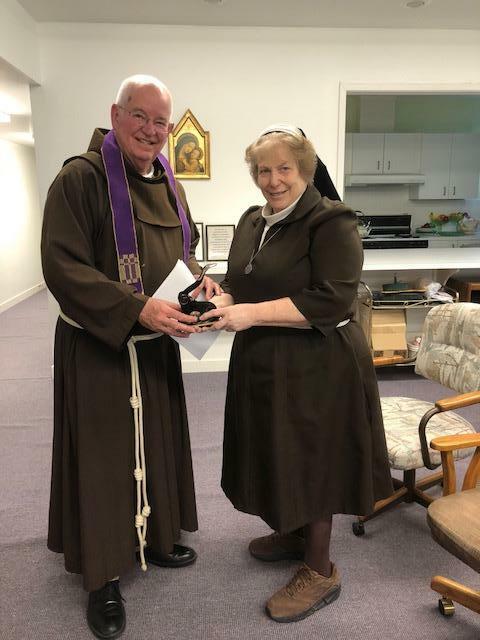 Provincial Minister David Gaa with Sister Marcia Kay, newly elected abbess. Marcia Kay, (abbess), Rita Louise, Debbie, and Colleen. 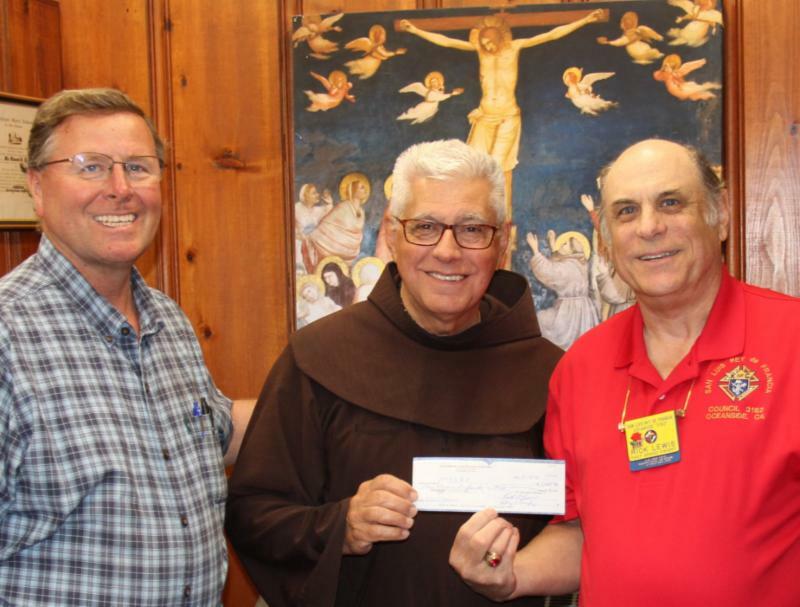 Knights of Columbus Council 3162 presented a donation of $11,040 to Mission San Luis Rey Parish for the re-roofing project on St Francis Hall. Shown here are Grand Knight Lee Bickford (l) and past Grand Knight Rick Lewis (r) presenting the check to Friar Vince Mesi, Pastor. 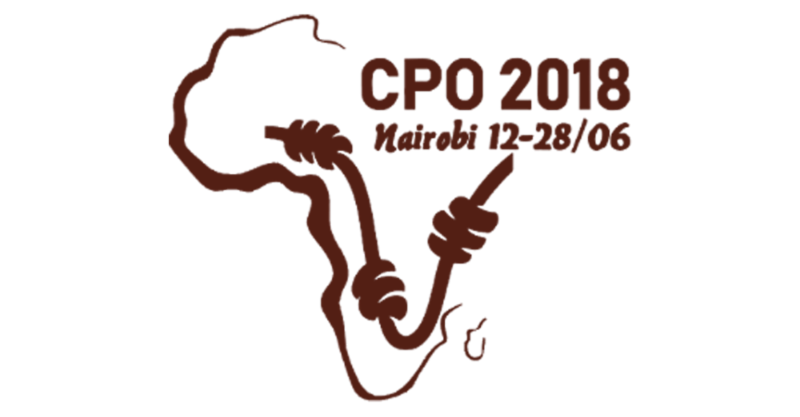 As you may know, from June 12-28, 2018 the Order will gather for its Plenary Council (PCO) in Nairobi, Kenya, to reflect on what's happening in the world, the Church and the Order. We will spend time in prayer, study, and discussion and hope to make decisions that will make us more effective in spreading the Gospel in a world in desperate need of it. Sign up, if you haven’t yet, to our PCO newsletter and receive updates - click on this LINK to subscribe. (Friar Alvin Te, a member of the Immaculate Conception Province, is a member of the Communications Team for the General Curia in Rome.-ct). 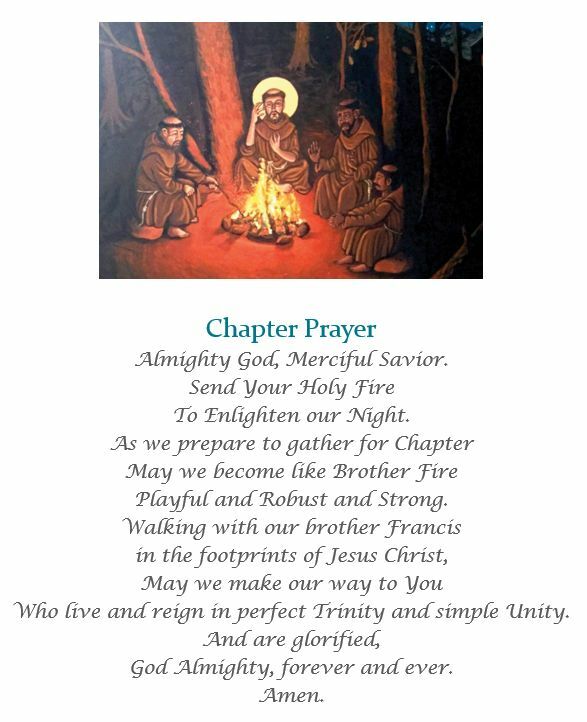 Franciscan artists are welcome to submit works for inclusion in the upcoming “Prayer & Devotion: Franciscan Artists, Franciscan Arts” exhibition slated for September 16-December 15 at the Veek Gallery of the Catholic Theological Union in Chicago. CLICK HERE for the poster/link.